Planning a celebration? A luxury party bus has many benefits when compared to a set location. Party Bus Richardson TX provides an array of attractive looking, modern and luxurious rides at affordable rates. Our staff will make sure that you have a great time while traveling around the city. Call us for pricing and availability 214-206-9269. We offer the best quotes in the region. When you consider their service, qualified staff and amazing rentals, no other party bus provider can match those packages! 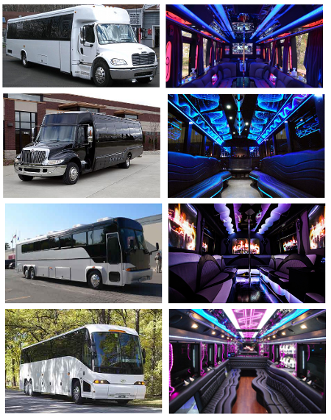 Why Party Bus Rental Richardson TX? Finding transportation which is ideal for your next big event is now very easy. With the complete fleet of party bus rentals, you can find the best vehicle according to your number of passengers as well as the budget. For people traveling with less than 20 guests, you can take advantage of our limo service in Richardson, TX! We have buses that can cater to a range of events such as prom nights, bachelor parties, bachelorette parties, weddings, birthdays, family reunions, and more. We have catered to many different events over the years, and we know how to handle any kind of party. For really big groups, try our Charter bus rentals in Richardson. Contact our support team now: 214-206-9269. The North Texas Automotive Museum – a must visit attraction for all the motor heads! Eisemann Center for the Performing Arts – for a fun night checking out performing arts. Studio Martica – let yourself be spoiled at this spa! Ziggy’s Tavern – get your party started at this cozy tavern. AMF Bowling Center – a fun night can do a bit of bowling! Phoenix Foot Spa – another great spa for all the party ladies! Couch Lounge – popular stop for drinks and night life. Alamo Drafthouse Cinema – if a movie’s in your plans. Tuzer Ballet – another hot spot for arts and performances in Richardson, TX. Don’t waste your time traveling in a smelly taxi, when you can start the celebration right from the airport with a party bus. Make your reservation in advance for to ensure we pick you up or drop you of at the Dallas/Fort Worth International Airport, Dallas Love Field, Addison Airport or any other airport nearby. If you happen to be in Plano, Garland, Addison, University Park, Sachse, Highland Park, Carrollton, Farmers Branch, Rowlett, Allen, Plano, Dallas, The Colony, Mesquite, Frisco or any other city nearby, we will come help you get your party on track!